On February 24th, Chronic Ice, the delicious all-natural hemp iced tea, will join over 30 food trucks for an evening of great food, awesome music…good times. 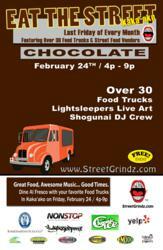 Chronic Ice is sponsoring Eat the Street on February 24th. Chronic Ice, an all-natural hemp iced tea, has recently been introduced in Hawaii, and is quickly growing in demand with consumers who want a refreshing alternative to the chemicals and corn syrup found in many ready-to-drink teas, sodas and energy drinks. On Friday, February 24th, Chronic Ice will quench the crowd at Eat the Street Honolulu, a gathering of more than 30 food trucks in Kaka’ako. “Chronic Ice is proud to sponsor one of the best street parties out there, Eat the Street. When you get thirsty from all that amazing food, stop by our booth to try our all-natural hemp iced tea,” invited Jamal Weathers, a co-founder of Greenlight Beverages, the maker of Chronic Ice. Chronic Ice is a health tea, and the nation’s first premium hemp beverage. It is made with organic sugar cane, whole-leaf green tea, black tea and hemp seed. Each serving of the antioxidant-rich, healthy tea is free of preservatives and high-fructose corn syrup. It has been tested with oncologists and enjoyed by celebrities like Cee Lo Green, Goodie Mob, Drake, and boxing champion Floyd Mayweather. Californians have been enjoying Chronic Ice since 2008, but the all-natural hemp beverage has just been introduced to Hawaii through a distribution deal with Hi Sea Distributors. Chronic Ice is now available in 25 stores, including Ohana Greenhouse locations on the Main Island, Oahu, and Maui. The health tea will soon be offered in 60 stores on all 7 main islands, including major chain stores. For more information about Hi Sea Distributors, email hiseadistributors(at)gmail(dot)com or call Dean Van at (808) 333-2369. The Lemon Classic flavor of Chronic Ice is now available in stores around California, Hawaii, Oregon, Washington State, Washington DC, and Florida. Two new flavors of Chronic Ice hemp iced tea will be introduced next month: The Grape Escape and Peach Perfection. Greenlight Beverages will simultaneously launch its first soda, Chronic Ice Ginger Ale, made with real ginger extract, cane sugar, and hemp seed powder. With the launch of the new varieties, all flavors of Chronic Ice will get a completely new packaging design that expresses the hemp beverage’s refreshing-now-and-healthy-later benefits. Eat the Street takes place on the last Friday of every month at 805 Ala Moana Blvd. (the old Cutter Used Car lot, next to the Acura dealership) in Kaka’ako. This month, the free event will be held from 4pm to 9pm on February 24th. In honor of Valentine’s Day, the theme is chocolate. For more information, visit http://www.streetgrindz.com/eatthestreet/. For more information about hemp seed, Chronic Ice health tea or Greenlight Beverages, visit chronicicetea.com or call (213) 599-8146. Greenlight Beverages is a Los Angeles-based company focused on bringing healthful drinks to the alternative beverage market. Greenlight Beverages is proud to present Chronic Ice, the nation’s first premium hemp beverage. Made with green and black teas, hemp seed powder, and pure cane sugar, Chronic Ice is the perfect alternative to the chemicals and corn syrup found in other drinks. Chronic Ice is the nation’s first premium hemp beverage.